Sports Costs > How Much Do Skis Cost? How Much Do Skis Cost? Skiing can be a fairly expensive sport, especially when you are first starting out. Once skis are purchased, the amount of time they last depends on the quality of the ski. Most skis will last about 5 years, but this depends on how often you ski; if the snow is hard or soft; if you ski on flat hills or bumpy; and if they are made with foam insulation or wood. The life of your skis can also be lengthened by having them regularly maintained and serviced at a local ski shop. Kids skis can be found for $75 to $250 at most local stores. For example, REI has the Rossignol Avenger Pro X1 kids skis available for $175. Adult skis can be found for $300 to $1200. This price varies greatly due to the manufacturer and the quality. The Solomon X Wing skis, for example, can cost $400 at Dunhams while the Connelly Prophecy Slalom ski will cost $1279 at Gander Mountain. Cross-country skis can cost anywhere from $90 to as much as $350 depending on the brand. These type of skis are ideal for those who want to maneuver through the snow rather than go downhill. Twintip skis can cost anywhere from $140 to as much as $800. Twintip skis tend to have a narrower waist compared to traditional skis. Installing bindings to skis can cost $30 to $60 per ski. However, some stores will do this for free if you purchase your skis through them. Getting the skis waxed professionally can cost $30 to $40 at most. Some skiers opt to ship their skis to a destination. If you were to do this, it could cost anywhere from $39 to $69 for a ground shipment or up to $150 if it needs to be at a destination by the next day. Skis are not the only thing necessary for skiing. You also need ski boots and many other accessories. Helmets designed for skiers can cost anywhere from $30 to as much as $150 depending on the type of brand and quality of the helmet. For example, a popular product, such as the Giro Encore 2 Snow Helmet, retails for $33 to $60. Some helmets may have goggles which are built on, but the goggles may be an additional accessory that has to be purchased as well. Skiing clothing, such as jackets and pants, can start at $20. Clothing will greatly vary depending on the material, type and brand. Boots will also be another essential accessory that one may consider. Skiing also costs money every time you go. This price will vary depending on the mountain, location, and time of year. 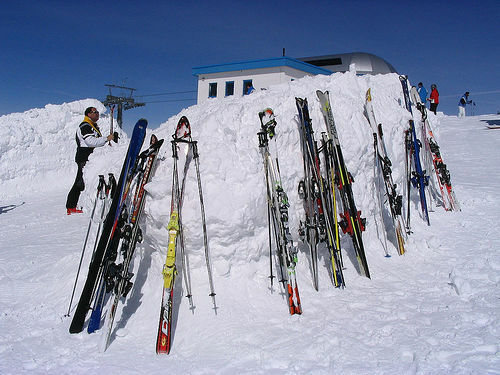 The most common types of skis can include all-mountain, all-mountain wide, powder and backcountry skis. Depending on the brand, many skis come with some type of limited manufacturer’s warranty. Most skis come with the bindings needed to attach your boot to the ski. In rare cases, these are sold separately. Choose a ski based on your weight, height, skill level and the terrain you plan on skiing. A ski tail, while on the ground, should touch you between your eyebrows and nose. Before purchasing a set of skis, be sure to read the reviews online to see what other skiers are saying. It’s wise to compare at least three skis before making a final decision. Take a look at the type of snow you’re going to ski on. Each territory throughout the world will have different types of snow. There’s no reason to purchase skis for thick snow when you’re only going to ski through light powder based snow. If you don’t feel like doing the research online, consider talking with a ski shop. Most have experts employed will be more than happy to discuss the best skis. Consider trying the skis on in person. While you may not be able to test them out, it’s ideal to test to feel by putting your boots in them. If you purchase skis during the peak skiing season, you will pay much more than you would in the offseason. The best time to buy skis is at the very end of the skiing season when most stores have clearance sales. Skis can also be purchased used through websites such as Amazon, Craig’s List, and eBay. If you’re traveling via an airline, you may want to consider renting your skis instead of checking them in as baggage. As Popular Mechanics notes, it can cost $50 each way to check both your boots and skis. If you were to rent, it would only cost about $25 to $50 per day.